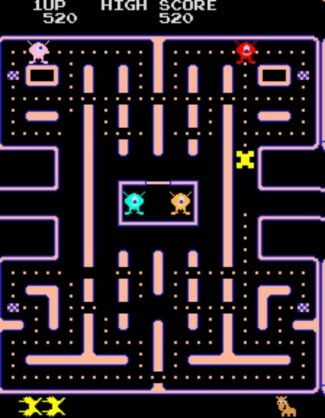 This game is simmilar to “PuckMan” and “Pac-Man” drastically changes the artwork of both Pac-Man and the ghosts, to some more abstract yellow character, and various colored cyclopes respectively (the eyes have naturally been turned into one single eye). Joyman also contains a very altered maze, changing the colors, and the arrangment of the allies. The allies are arranged more like columns than before. There are dots that straddle several of the allies. While the dots are present, and as long as Joyman does not lose a life, Joyman can continue to pass through the gaps in allies. However, if Joyman loses a life, some of the gaps close upon his return in the next life. The bonus prizes and the music have also changed.